IBM® Rational® DOORS® Next Generation offers tools for capturing, tracing and analyzing requirements for complex products and systems as part of the IBM Watson® Internet of Things (IoT) portfolio. It allows you to take control of your project costs with change and configuration management built directly into the requirements tool. This software is available on premises and in the cloud. Word processor or spreadsheet users can benefit from having all their requirements available from a secure, central and accessible location. They can understand what changes have been made and who made them, when they were made and what they affect. They can organize, trace and link priorities and requirements across the development lifecycle; or view history, reviews and discussion comments within the context of the document. Create multiple views with a different perspective of data. Systems and software engineering teams can improve collaboration and project agility through concurrent editing, automated versioning and effective prioritization. They can access requirements databases concurrently across multiple users without conflict or disruption, while ensuring that teams use consistent terminology with an integrated glossary. Visualize information through customizable dashboards and automated reporting. Edit, author and analyze artifacts on a feature-rich web client. With no hardware, provisioning or installation needed to host the solutions, you can optimize operating costs by reducing the upfront capital costs typically associated with information technology (IT) infrastructure investments. You can more easily scale up service with subscription-based services, and get reliable and security-rich data center facilities that have built-in high availability, redundancy and failover supporting infrastructure. Requirements management solution users can manage change across the product lifecycle for faster impact assessment and better quality. They can explore information with more granularity with individually managed information and artifacts. You can assess the impact of changes more quickly by linking change requests to requirements. Drag-and-drop traceability is also supported. This software allows you to utilize proven models and templates for certification and compliance. IBM has a long history of working with business partners that understand the challenges of requirements management. IBM surrounds these partners with the right tools, training, expertise and support to help their clients become industry leaders in managing requirements efficiently. Visit the Jazz.net site for a list of partners with Ready for IBM Rational validated integrations to Jazz-based products and cloud partners that host Jazz solutions. IBM Rational DOORS 9 users who want a single-server or purely web-based requirements solution can create a stronger collaboration among multi-disciplinary product development teams. Access a single server solution across disciplines, time zones and teams. Integrate with IBM Rational Team Concert™, IBM Rational Quality Manager and IBM Rational Rhapsody® Design Manager on IBM Jazz™ collaborative lifecycle management platform. Migrate easily from Rational DOORS using a built-in migration tool. 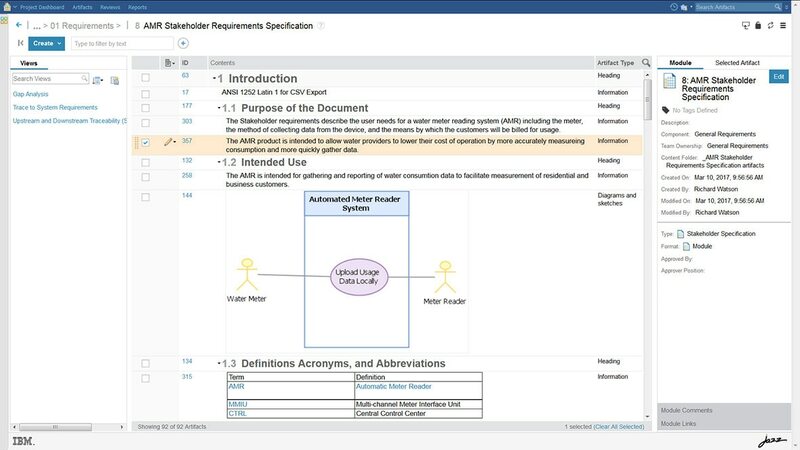 Have the IBM Requirements Quality Assistant evaluate and provide recommendations using ten parameters from the INCOSE standard to evaluate, score and provide recommendations to improve requirements saving time while optimizing resources. Discover the software requirements for Rational DOORS Next Generation with IBM Software Product Compatibility Reports. Discover the hardware requirements for Rational DOORS Next Generation with IBM Software Product Compatibility Reports. Extends collaboration for improved software quality and delivery.